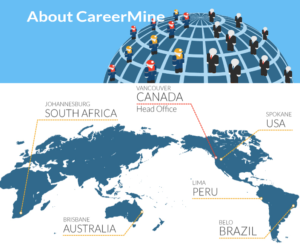 Started in late 1998, CareerMine, a division of InfoMine, provides the largest dedicated job board to the mining industry worldwide. CareerMine provides the ideal platform for job seekers to find employment opportunities and interact with companies and recruiters who are hiring. Companies in the mining industry can showcase their employment opportunities, company profile and career paths for both graduates and those already working in the industry. InfoMine is the world leader in providing mining knowledge online, delivering content via our website, through corporate intranets, and by email. Summary: Since 1998, InfoMine has been providing its users with global information on the mining field. It also has a career section, which is specialised in mining career opportunities from all over the world. Despite a decent following on social media, CareerMine hasn’t been as active on Facebook for a while (14 016 followers). There are also 12 365 followers on LinkedIn and about 29 200 on Twitter. According to the site, there are headquarters in Canada, USA, South Africa and Australia. The visibility has dropped over the past 4 years from 1 million visits a month to 579 810 today. This reflects how the mining industry has been evolving over that time too. Considering most of the job offers are for Australia, the country doesn’t make it into the top 5 countries visiting the site. Design: The page might seem a bit outdated, but when you click on the career section, the page becomes far more modern. The career page is, however, relatively empty. The search engine (keywords and location), a few suggested services and some company logos fill up the homepage. The company pages are beautiful and some lead directly to the company site, but it’s difficult to find the job offers on a number of them. In the job listing, the filters (category, region, country, state, language, employer type, workload, work term) appear on the right-hand side and the number of offers per category appears in brackets. Each job offer takes up a single line in the job listing, which includes a logo, the job title, the publication date and the location. The job offers themselves vary from company to company depending on how much customisation they wanted. The job board objective: InfoMining strives to keep mining professionals and those with an interest in the industry informed on all the current news. It also offers companies from all over the world a place to advertise. Recruiter observations: To inquire about packages, you must contact the sales team. There is no https:// security for the contact form. You can create an account though. Jobseeker observations: Job seekers don’t need an account to apply to job offers and the only account you can create in an employer one anyway. The job offers: There are 8 062 job offers on the site. Most of the offers are in Australia, followed by the US and Canada. Reactivity: There is chat support. It takes the team a couple of hours to answer at the most. If you send an inquiry through the recruiter portal, it can take a bit longer. Special features: The job fair section (which is actually a list of companies and recruiters); the salary survey; the salary insight generator (for which you must be registered); the courses (which you can sort thanks to filters); the work environment section (providing information about working in mines); the events (through the main webpage); the minimarkets; the news; a couple of YouTube videos; chat support; job alerts. Verdict: As far as job boards go, CareerMine makes it easy for jobseekers to apply to offers, even if they can’t create an account. Recruiters must go through the team for their job post orders, which can make the process longer. That said, it’s best to discuss any investment. The visibility is for the site and not the career section specifically, but a number of the giant companies (like RioTinto) think CareerMine is worth advertising on. Login here for FREE to unlock access to the traffic audience, content and pricing section for more information on CareerMine.